We fell in love with this unique "tossed-word" fabric at first sight. This drawstring bag makes the perfect witchcraft accessory. 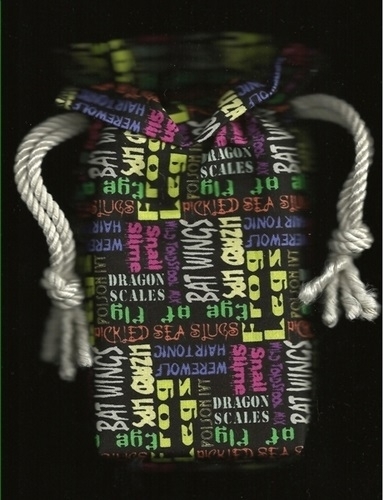 Words on the bag represent magick potion ingredients including bat wings, frog legs, snail slime, wild toadstool mix, pickled sea slugs, lizard lips, poison ivy, dragon scales, werewolf hair tonic, and eye of fly. So clever! 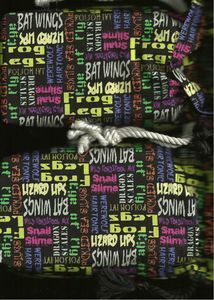 The fabric background is black and the mixed font words are shown in lime green, bright green, orange, purple, hot pink, platinum, sage, and yellow. Choose either the platinum cord shown in the first picture or a black one. The second picture shows the words with the bag tilted on its side. The tossed pattern of the words allow it to be readable from all angles. Size: The Regency-style ruffled tarot bag is 7-1/2 x 5 x 1 inches. It fits most standard sized tarot decks that are up to 3-1/4 x 5-1/2 inches. There is an one-inch ruffle on top and an one-inch gusset (tote style) at the bottom. It is made of cotton and closes with two drawcords made from 36 inches of twisted rope decorator cord. The tips of the cords form small tassels.